Good afternoon. It was nice and cool overnight, so I got to sleep in a bit late this morning. By the time I had made my coffee and fed Pogo his breakfast, I only had enough time to crop some photos for today's blog before I had to get dressed for our appointment at the shooting range. Today is a bit cooler, sunny and simply gorgeous! When Deanne showed up, she brought me a beautiful bouquet of orange roses. Wow! What a way to start a day! I'll have to take a photo of my beautiful flowers. 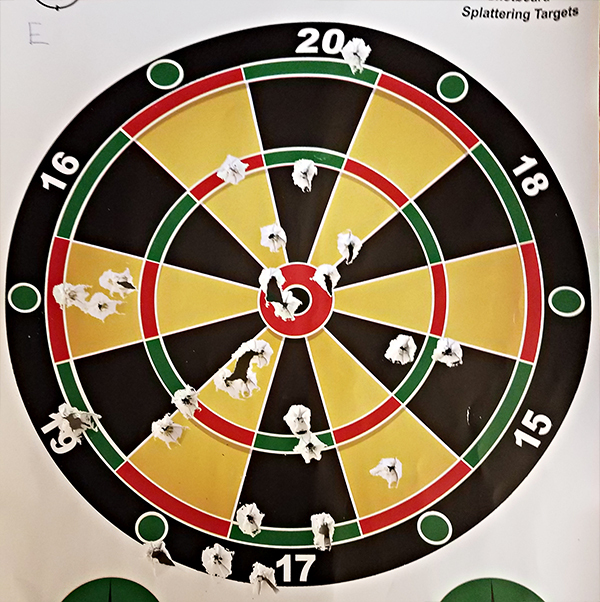 At shooting practice, I didn't do as good as I had wanted to do, but I did pretty good considering my shoulder is sore and arthritis is keeping my trigger finger sore. I'll take a photo of my target later. When I got home, there was a box of yarn waiting for me on my porch. Woo Hoo! Now I just have to wait for one more box of yarn and I'll be all set for my next few projects. Well, that's the plan anyway. Last night, I finally finished the pink hat. 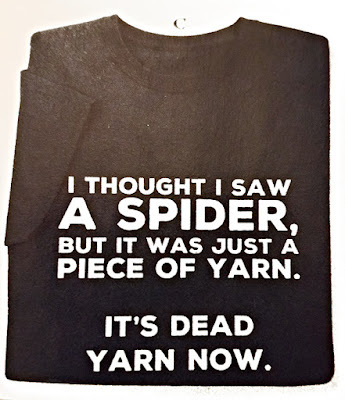 I don't think I'll be working with that yarn again. But the pink hat and scarf are really pretty. Here are photos of the pink set and the gray set. 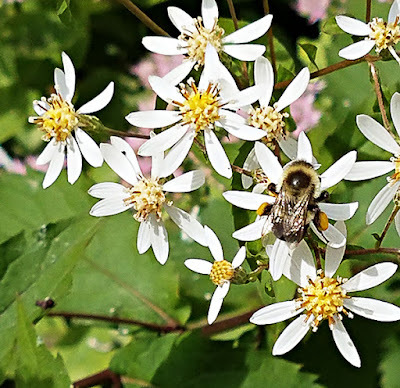 Yesterday afternoon, while Pogo and I were out in the yard, I took a few photos of some of our blooms. 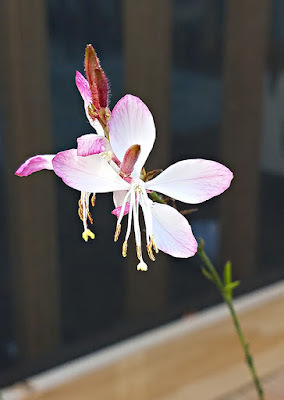 This one little blossom is really quite delicate, but very pretty. While I was outside, I also took a photo of my little rain gauge. 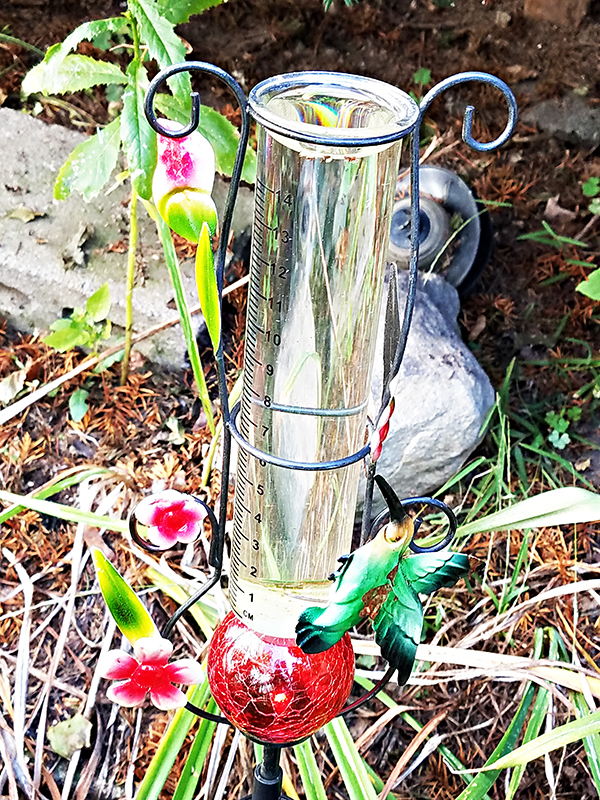 It's full of water, so I think I'll have a look to see if it is measuring in inches or centimeters. I think I saw a little cm on the bottom of the glass. 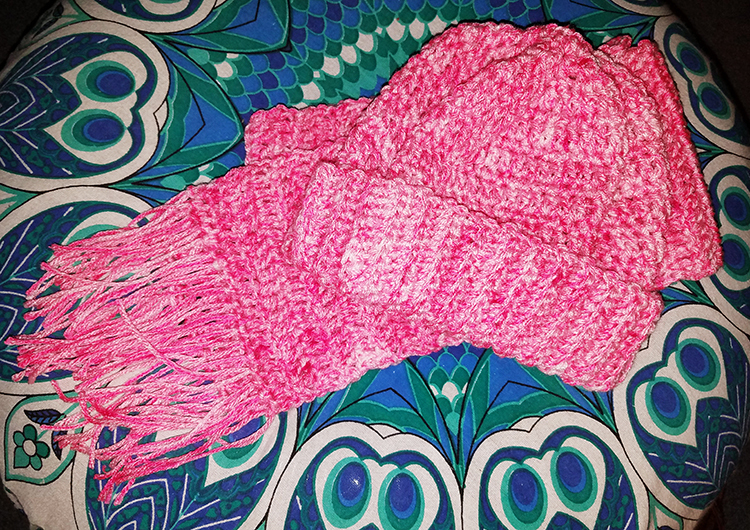 Once I finished the pink hat and scarf, I started a new set. The yarn for this one is called Tuscan Night. I'll have to take a photo of it. The colors are greens, with a touch of light blue and rusty red. It's really quite interesting. This afternoon, I think Pogo and I will sit out on the porch for a while and enjoy this lovely weather. Maybe I'll work on the hat set while we're out there. First, I want to catch up on my blog reading. I want to say a special "Hello" to Angelica. I've been so worried that she might not be well, and I've finally heard from her. She has been through some wicked health issues and could use some prayers to keep her in good health. Be well my friend. Email me if you can. Now it's time to take my coffee and head for the porch. So, till Sunday, Y'all have an awesome weekend. Good morning. 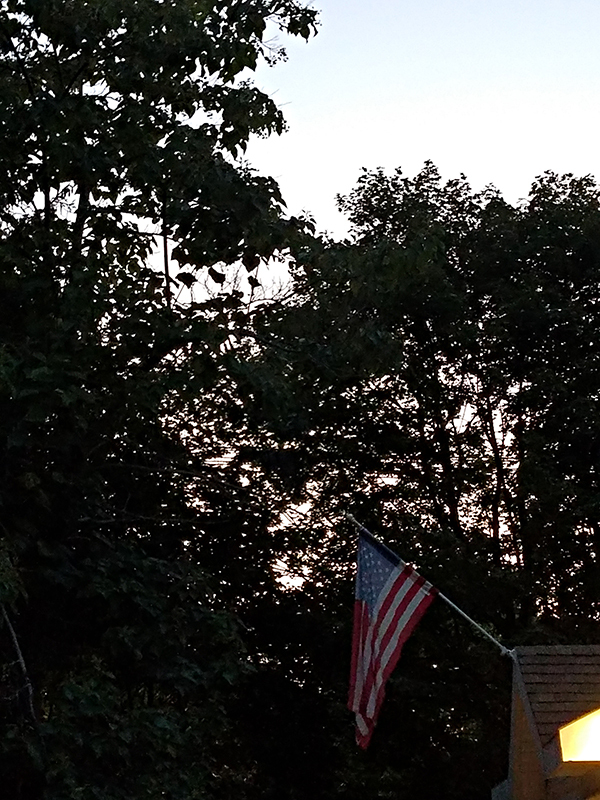 Here in New England, we're enjoying another beautiful day with temps in the seventies and a light breeze. I'm tired this morning because it was hot and sticky all night long. Sleep did not find me until around four this morning. I will definitely be needing a nap this afternoon. The next few nights will be quite a bit cooler (in the high forties), so sleeping will be much more comfortable. Late yesterday afternoon, DIL Janet came by after work and we had a really nice visit. She finished that queen size bead spread (afghan) that she was making, and now she's working on a double size one. This one will also be a Christmas gift. We talked about her work day, and for a while I missed going to work. Don't get me wrong, I don't miss the work itself or the travel time, but I do miss the closeness that I had with nature there. 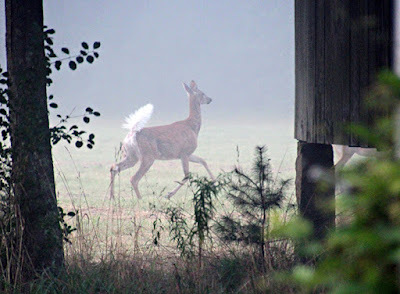 The Mrs had a lot of property that housed a lot of wildlife. 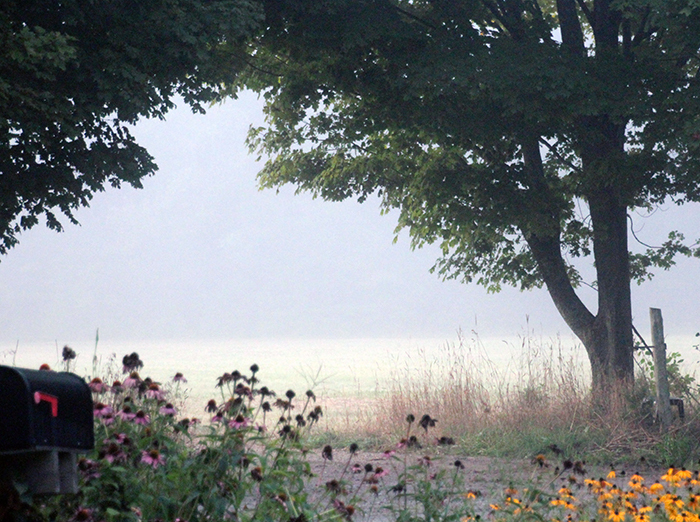 In the morning, the open fields would be hidden beneath a blanket of fog and mist. 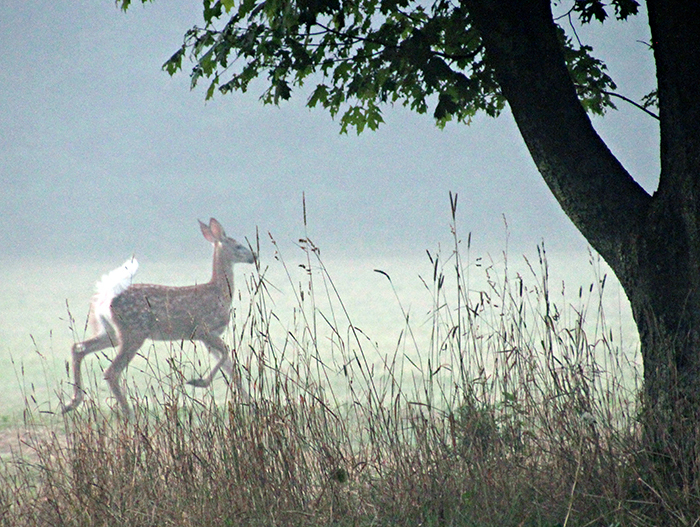 As the mist started to rise, you sometimes got a glimpse of some of the animals that were grazing. Yup, this is what I miss about working. I don't get these beautiful views here from my yard. Every now and then, a deer or some turkeys cross through my yard, but I don't usually get to see them. Last night, I worked on a pink hat that I had I started the night before. Folks, this yarn - the gem colors from Red Heart - is beautiful and looks really nice when worked into a scarf or hat. However, it is the most difficult yarn I have ever worked with. The yarn is twisted loosely, and keeps splitting. I only had to do eleven short rows to finish the middle section of the hat. At the end of the evening, I still did not have all my rows done. I check my work as I go along, and if I don't see any errors, I keep going. Unfortunately, every time I am finishing up a row, I find a boo boo down about two or three rows. It's rip out time again! 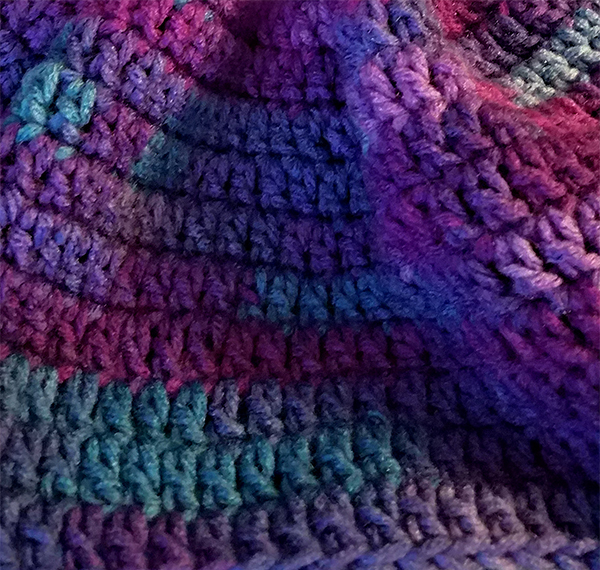 I could have made three hats with regular yarn in the time I've spent working on this one hat. Yeesh!! I spent a lot of time yesterday looking for that missing tax folder. Nope, I still haven't found it! I just don't understand. It has been in one spot since last April. All of a sudden it has vanished. Thank goodness Pogo makes noise and can move about on his own or I'd have probably lost him too. Well, the morning is passing me by and my coffee is cold. It's time to make a fresh cup and sit out on the porch for a while. So, till tomorrow, Y'all have a fantabulous day. Good morning. Well, I tried to sleep late, but Pogo was insisting that I get up and make breakfast for him. So I did, but now he's not so happy with me because I gave him a dish of doggie food. Gosh, does he think that this is the Ritz Carlton with room service? Sorry sweetie, I'm not cooking hamburgers at nine o'clock in the morning. 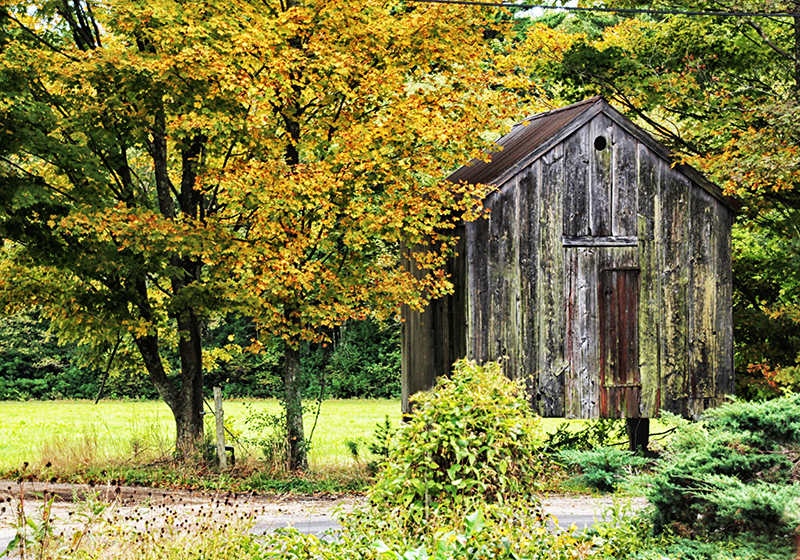 Today I think we'll sit out on the porch and enjoy this last "Indian Summer" day. Tomorrow temps will drop down to the seventies and the night temps will be in the upper forties. Actually, the night temps will stay in the forties for a whole week. At least that's the forecast for now. Yesterday, Pogo and went to the Jewelers Salon to see if my rings were ready. Unfortunately, they were not. The part that came in for one of the rings was not the right part so it had to be reordered. But, I was told that they should be ready by next week. Gosh I hope so. After that, we went shopping at Ocean State Job Lot. I found a couple things that I needed for Christmas, and on the way out we picked up three more big bags of bird seed. Next we headed for McDonalds for some take out. All in all, we had a super nice day. Sad to say, I haven't been spending very much time on my laptop this week. I thought I might, but it hasn't worked out that way. Today, before I can do anything, I must find a folder that I have somehow misplaced. I always keep it one place, but for some reason it is not there now. This folder contains all my information and slips for paying state and federal taxes every few months. I'm working up a sweat just thinking about where I could have set it. Today, I dug out an older kit that I thought might be fun right about now. This one is all about circus fun, and is called Monkey See, Monkey Do. I hope you can have some fun with it. How about some more "smart" information. For a splinter remover, just pour a drop of Elmer's Glue-All over the splinter, let it dry, and peel the dried glue off the skin. The splinter sticks to the dried glue. For killing fleas instantly, Dawn dish washing liquid does the trick. Add a few drops to your dog's bath and shampoo the animal thoroughly. Rinse well to avoid skin irritations. Goodbye fleas. To cure doggie odor on a rainy day, simply wipe the animal down with Bounce or any dryer sheet. It instantly makes your doggie smell springtime fresh. I guess that's enough "smart stuff" for today. I really need to get busy and find that missing tax folder. So, till tomorrow, Y'all have a fantabulous day. Good morning. Today is another really gorgeous day to enjoy. Temps today and tomorrow will reach the low eighties, with the cooling down starting on Thursday. It's sort of like the Indian Summer of days gone by, and I'm really enjoying it. Not much special happening around here. Yesterday was a lazy day for Pogo and me. We sat out on the porch and I looked through a new batch of catalogues that came in the mail. One in particular that I like is "Starcrest Of California." 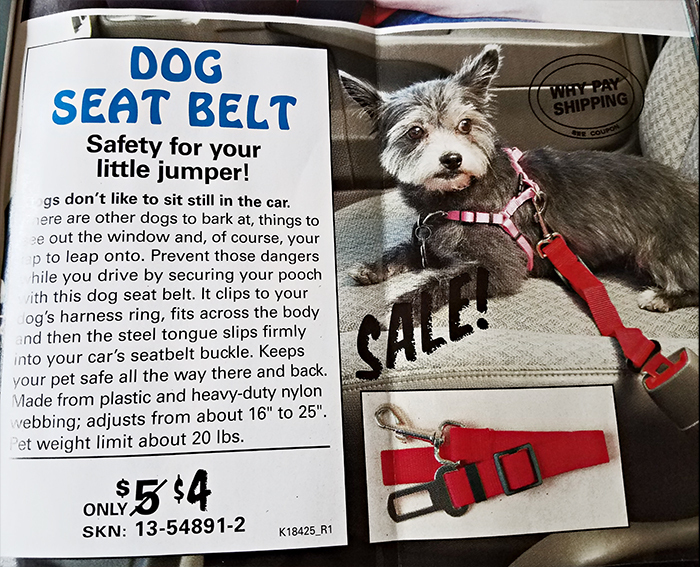 One item that some of you might like is a safety belt to put in the back seat of your car for your fur baby. Pogo has one in his car seat, but for those pets that like to sit on the seat, this could come in handy. 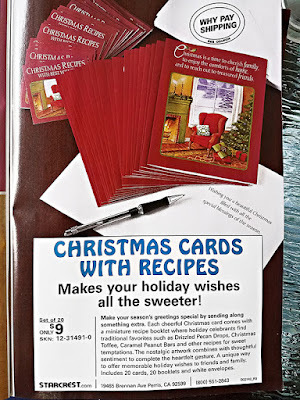 Another really nice item is the Recipe Christmas Cards. For your friends who love to cook and try new recipes, these are wonderful. 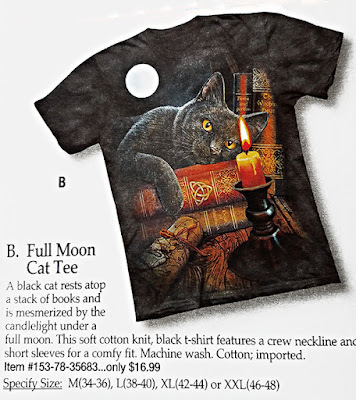 One of my favorite items is a tee shirt. Isn't this one awesome? Especially for this time of year? Hmmm, I may have to get me one of these. The best part of this catalog is the free shipping. I always find something here that I am looking for. I go right to their website and order online because my order will come faster that way. So that's one of the things that I'll be doing today. I also want to call the Jeweler to see if my other two rings are ready to be picked up. If they are, then Pogo and I will take a ride out to pick them up. Pogo has been sitting by the door all morning, just looking out rather wistfully. so I guess today is a good day to go out and do errands. Maybe we can stop by Ocean State Job Lot store and pick up more birdseed. We must be getting low on it by now. I'll check before we leave the house. Somehow, though, every time we go in that store, we seem to find a basketful of things that we must have. Hmmm. I haven't been crocheting these past few days and my right hand is feeling it. The arthritis is acting up, especially in my first two fingers. Hopefully, my new yarn order will get here soon and I will be crocheting again. It keeps my fingers working. Well, that's about all my news for today. So, till tomorrow, Y'all have an awesome day. Good morning. Ahh, tis another gorgeous day here in New England. I absolutely love it! The big tree out front likes it too because the leaves on the bottom branches wave ever so slightly to every car or truck that goes by. Retirement feels really good today. Well, yesterday I loaded up all my dollies and their dresses, and all the trimmings, and headed for the porch. Once I got settled, I laid out all the trimmings and got started on the first dress. Ribbons, jewels, flowers, etc. This was going to be fun. Of the three special glues that I bought, none of them worked. When I squeezed the tube, I either got nothing or a big glob of glue (mostly on my hands). I finally got a bit of glue on a tiny flower and placed it on the ribbon. I held it in place for a couple minutes, then let go. So did the flower. It fell right off on to the table. The jewels did not sparkle, they looked so flat. The only thing that worked was the ribbon. So much for my fun and plans. This week I really need to buckle down and work on getting all my photos together for next year's calendar. It will be October soon, and shortly after that the Holidays will be upon us. I work on it all year, so it would be very disappointing if I didn't get everything done ahead of time. 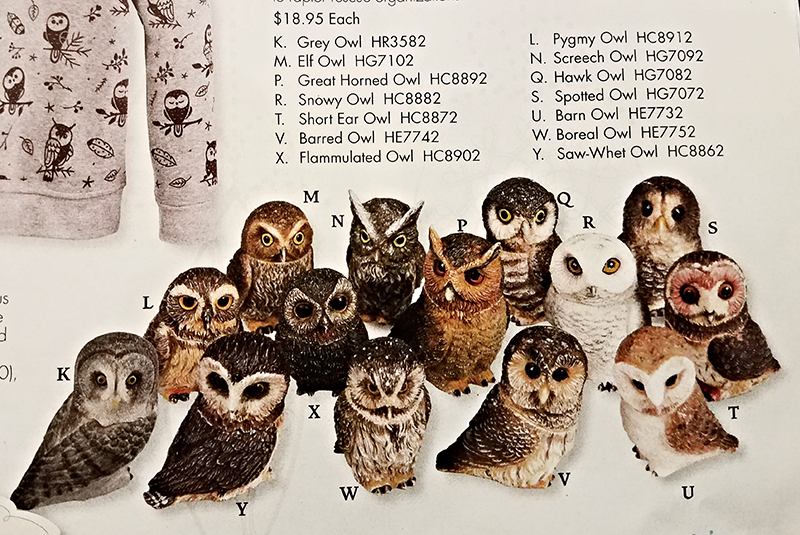 Looking through all my catalogs, it seems that folks who collect owls are in for a great year. There is owl stuff everywhere. In Signals catalogue, there is a whole collection of little owl boxes. Goodness, they are so cute! 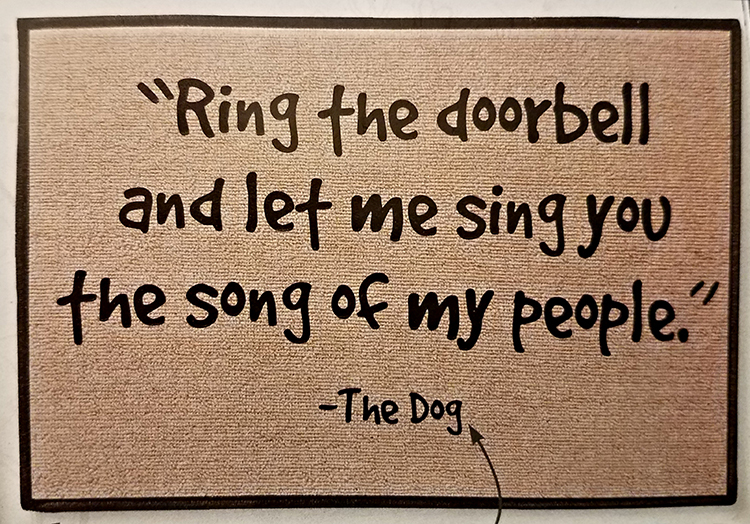 I also found a mat to put outside the door that reminds me of Pogo. No, I didn't order it, but it is cute. 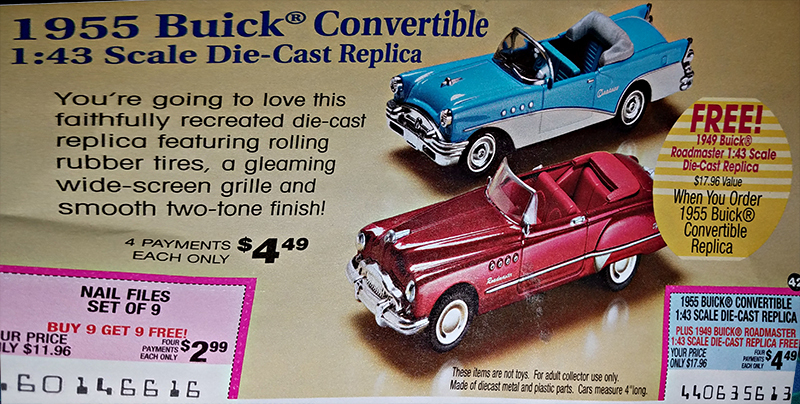 In another mail offering, I came across a little car that brought back so many memories of years gone by. 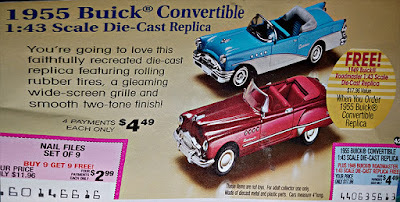 When Audrey was just a toddler, her dad and I had a 1955 blue and white Buick convertible just like the one in the ad. Somewhere, I have a photo of Audrey sitting on the hood of the car. I'll have to go digging around to see if I can find that photo. Well, the morning is slipping by, and I haven't done anything around here yet. That being said, I think I'll make a fresh cup of coffee and go sit out on the porch for a while with Pogo. Maybe I'll take my laptop out there and play on it for awhile. On this happy note, I'll take my leave. So, till tomorrow, Y'all have a fantabulous day. Ah, Such A Beautiful Evening! Good morning. Goodness, I wanted to sleep in really late this morning, but Pogo was ever so playful this morning. He jumps up on me, walks up to my face and gives me a kiss or just sniffs my whole face. This is his way of gently waking me up to make him some breakfast. I love it!! It's still a bit cool this morning, but the sun is shining and it is going to get nice and warm soon. We'll be having a few days in the low eighties and I for one am going to enjoy it. Today, Pogo and I will take our things out to the porch and enjoy this gorgeous day. Well, what can I say! 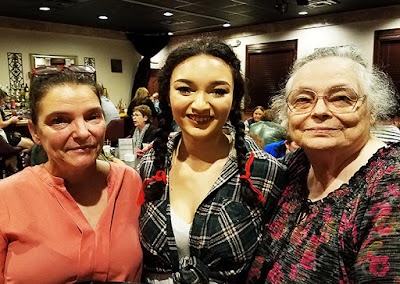 Last evening, Deanne and I, her friend Caroline, and Joe all went to the Cabaret to watch our Jazzy and the other Starliners. What a wonderful evening. Sometimes I think the show is even better the second time around because you already know what is coming next. We all enjoyed ourselves. Me especially. I am so proud of our Jazzy. Here's a photo of Deanne and Jazzy. That's one proud Mommy! And here's one with me and the girls. In October (and the beginning of November), the Starliners will be presenting Fiddler On The Roof. You know I'll be enjoying watching this. My hubby loved Broadway musicals, and this was one of his very favorite shows. The music was so beautiful. I think we went to see it three different times. Friday afternoon, the rest of my dolly body parts came in the mail. Woo Hoo! Now I can finish up my dollies. (That's what I'm hoping to be doing out on the porch today.) I have some boxes with tissue paper all lined up and waiting for them. I don't have a quick page ready for today, but I promise to have something ready in the next day or two. Now I'm going to make another cup of coffee and head for the porch. So, till tomorrow, Y'all have an awesome day. Good morning. 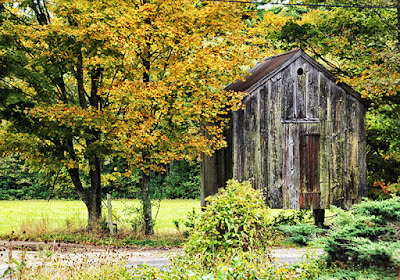 Today is the start of Autumn, and my goodness it is dreary! This morning has been gray with a bit of wind until a few minutes ago. Then the rain came. It is pouring! Across the street, someone is shredding a lot of wood, trees, roof tiles, etc. and it is rather noisy. Poor Pogo doesn't know whether to bark or hide under his blanket. We were going out to do a few errands today, but now I'll have to see what the rest of the day's weather is like. Maybe if the rain lets up this afternoon I'll feel like going out. The older I get, I'm not so crazy about driving in the rain and snow, etc. The other day I placed an order for more yarn, but then later I realized I had not ordered the right amount of some of the colors. This morning I received an email offering me free shipping, so I went back online and ordered more yarn. I will definitely have enough now to keep me busy for quite a while. At least I think I do. haha. 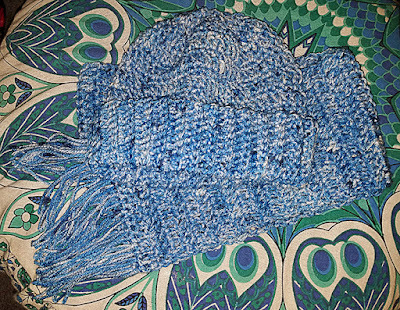 Last night I put the fringe on both of the scarves that I made and started one of the hats. When these two sets are finished, I will have one more set to make. Slowly, but surely, I'm getting all my projects done. 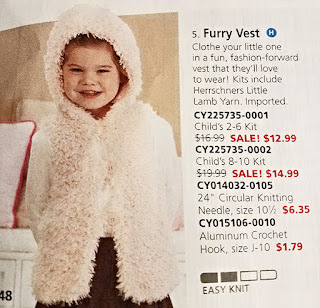 Here's a photo of the toddler hooded vest kit that I ordered. I thought I'd try to make two of these for my two youngest great granddaughters. 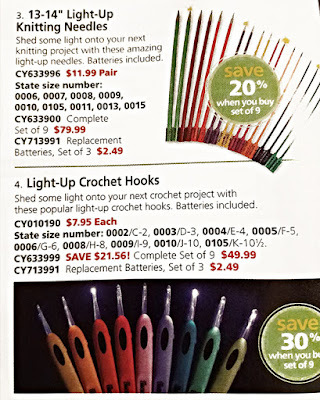 One rather interesting item that I found in the Herrschner catalogue is for lighted crochet hooks and knitting needles. They are battery operated. Can you imagine? What will they think up next? This morning I'm waiting for the mailman to get here. I have a whole stack of mail to give him. Most of it is bills. (what else is new?) 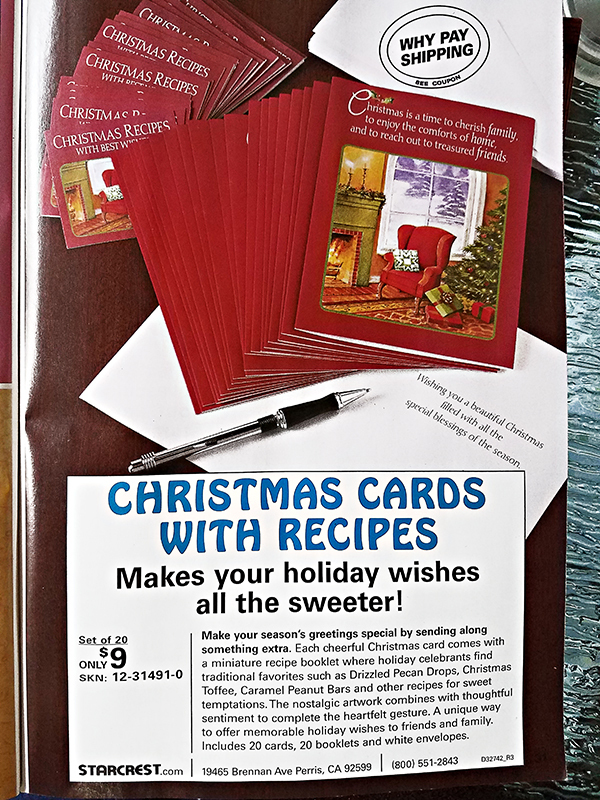 There's also a couple entries for the Publishers Clearing House. Do I really think they will ever show up at my door with that huge check? Of course not, but somehow it's nice to think that it is possible. Well, the morning is drifting away and I still have to wash the breakfast dishes. My goodness, I just can't wait to do that. (yup, right!) 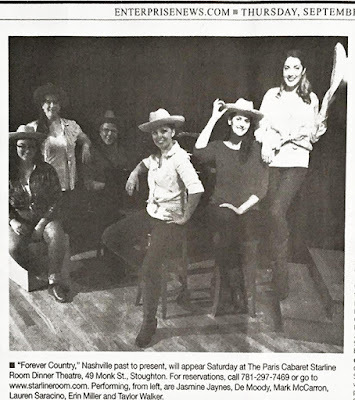 Tomorrow night, we're all going back to see Jazzy in the Western Theme at the Paris Cabaret again. This was very enjoyable and I can't wait to see it again. That's about it for news this morning. So, till Sunday, Y'all be safe and have an awesome weekend. Good morning. Well, today is starting off quite lovely. It's not raining, the sun is out and there's a little bit of a breeze. Temps should be in the upper sixties, maybe even the low seventies. Sounds rather nice to me. Today is Summer's last hurrah. Enjoy it Tomorrow we'll be starting a new season. 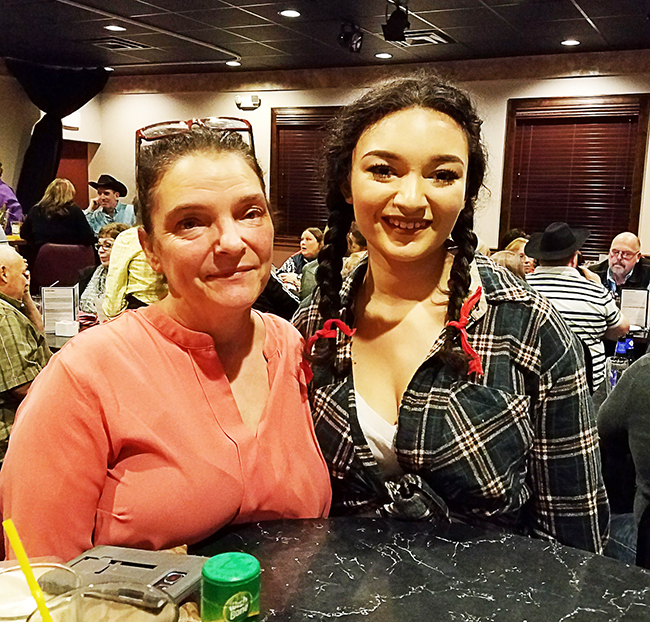 I just got a message from Deanne telling me that Jazzy is in a photo in today's newspaper. I'll have to get me a copy. There is an article about the Cabaret where she is performing and she's in the photo of their current entertainment. Woo Hoo! Here's a copy she just sent to me. It's not a great copy, but you can make out all the Starliners. Jazzy is on the far left. 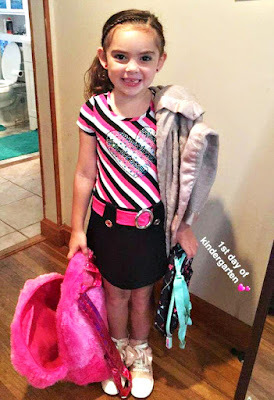 The next photo I'm sharing is of another of my great granddaughters who just started Kindergarten. This is Amelia. Gosh, she's a beauty, just like her mommy. I guess you can't tell how proud I am of all my family. Yesterday, Pogo and I braved the rain and went out to do some errands. First we went to the Jewelry Salon to pick up one of my rings. Bless my heart, now my hand doesn't feel naked anymore! This ring is special to me and I rarely ever take it off. When we left there, we headed for the hospital to pick up Pogo's flea medicine. Wowsie! What a shock I got! The price didn't just go up, it leaped for the moon!!! But we got it because he needs it and then we headed for home. It was really pouring rain by then so we figured the rest of the errands could wait for another day. Last night, DIL Janet came by and we ordered Chinese take out for supper. Even Pogo enjoyed some of this. The rest of the evening we crocheted and watched TV while we caught up on our chatting. It was a really nice way to end a busy day. As I look out my door, the leaves on the tree out front are dancing in quite a frenzy. The trees across the street are really shaking it up too. I guess this pick up in the wind is probably a bit of Jose as he passes by on his way north. I haven't been watching the weather channel these last couple of days. Maybe I'll get caught up with it later this afternoon. Well, that's about it for my news for today. So, till tomorrow, Y'all have a fantabulous day. Good morning. Tis another gray and rainy day here in New England. Pogo and I will need an umbrella when we go out to do our errands today. Pogo doesn't care though. He is just so happy every time we go anywhere in the car. Except for food, he is just so easy to please. Today we are going to the jewelers' store to pick up two of my rings. From there, we will travel to the hospital to pick up a refill of one of Pogo's flea medicines. He is super allergic to fleas, so he has to use two different flea medicines all during flea season. There's not much happening around here. 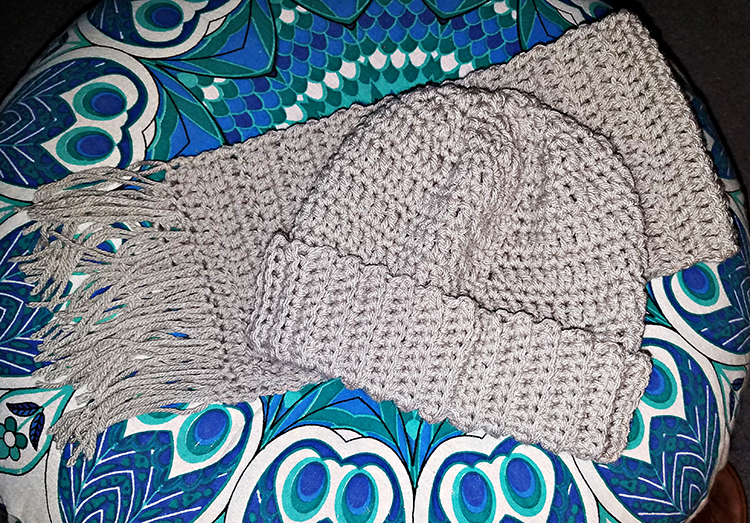 I started working on two scarf and hat sets. 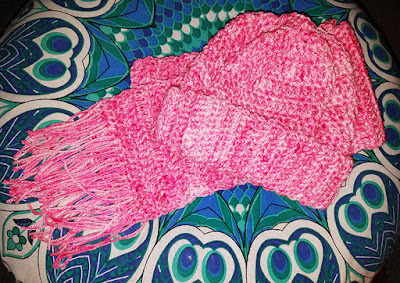 The gray scarf is done and I'm almost half way through the pink scarf. When it is finished, I'll make the two hats. I'm waiting for another order of dolly body parts so that I can finish up my air freshener dollies. 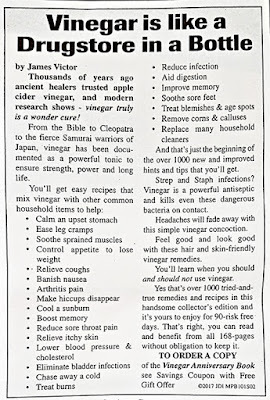 While I was poking around through some old papers, I came across this very interesting "Did You Know" article that I had printed out. I'll share some of it with you. Did you know that drinking two glasses of Gatorade can relieve headache pain almost immediately -- without the unpleasant side effects caused by traditional "pain" relievers? Did you know that Colgate toothpaste makes an excellent salve for burns? Or that chewing on strong Altoids peppermints will clear up your stuffy nose? For achy muscles from a bout of the flu, mix one Tablespoon of horseradish in one cup of olive oil. Let the mixture sit for thirty minutes, then apply it as a massage oil for instant relief of aching muscles. For menacing bees, wasps, hornets or yellow jackets that get in your home, try a spray of Formula 409. Insects drop to the ground instantly. I'll save some more of them for tomorrow. 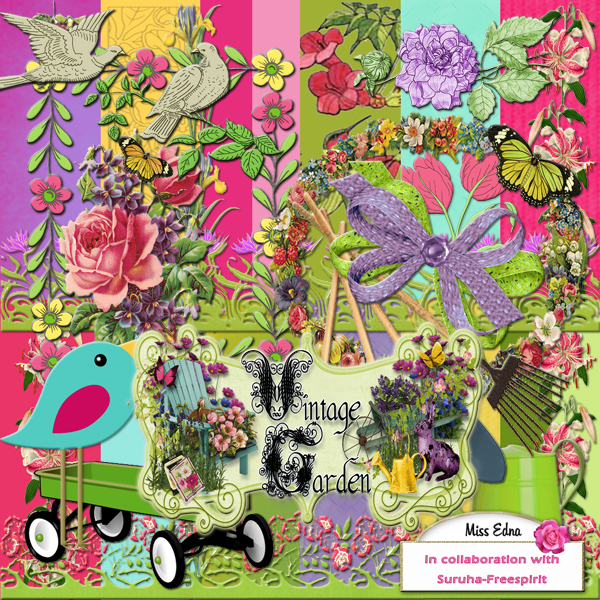 Today I'll post an old kit called "Vintage Garden" that I did years ago in collaboration with a friend. This is my portion of the kit. 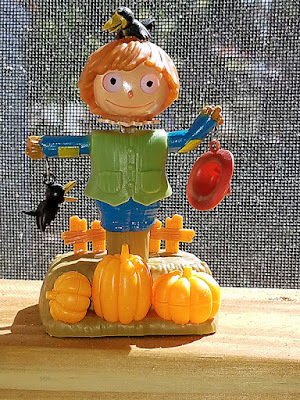 While Pogo and I have been running around lately doing errands, I'm noticing that the trees are beginning to change color, and leaves are falling everywhere. Actually, my driveway is collecting quite a few of them. I dug out a photo from my archives that shows how the trees look now. Folks, today and tomorrow are the last two days of summer. Go outside and enjoy it, even in the rain. The rain is still warm enough for us to be out in it. This reminds me that flu season is beginning so be sure to get your flu shot soon. If you are my age, you'll want the extra strong shot. I think I'll be getting my shot before the week is out. Tonight is the beginning of Rosh Hashanah. To all my Jewish friends and family, I'm wishing you a healthy and prosperous New Year. Friday will start a brand new season, Autumn. And, in just five and a half weeks, Pogo and I will be off on our "Round The World" ride with all our witchy friends. Gosh, this year is passing by so quickly! Now I think I'll make me a fresh cup of coffee while we wait for the mailman to get here. 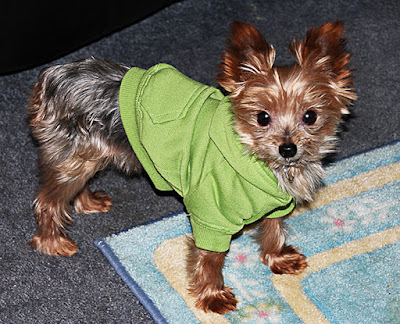 After that, Pogo and I are off to do our errands. So, till tomorrow, Y'all have an awesome day. Good morning. Yup, tis another gray, wet day here in New England. I hope the heavier rain holds off until after I get home from my doctor appointment this morning. It looks like there is a healthy breeze going on too. Every now and then the leaves on the tree out front start dancing excitedly. 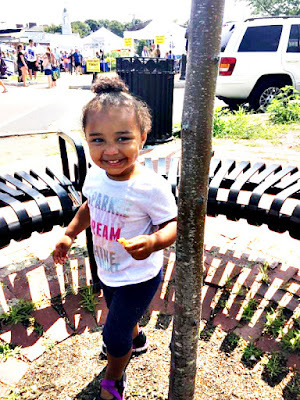 Before I forget again, let me wish a Happy Birthday to great granddaughter Alena. She turned five years old yesterday. 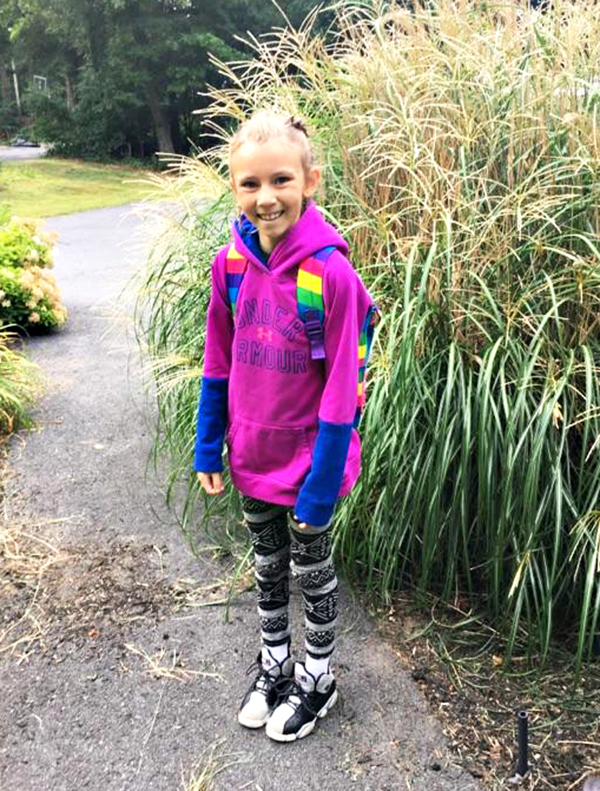 Alena, I hope your Birthday was just awesome! 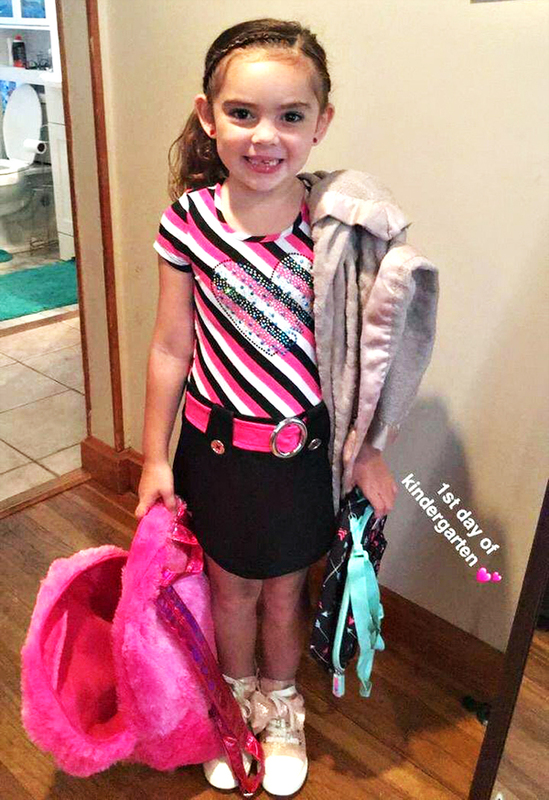 Here's photo that her grandma (Audrey) sent to me last evening. 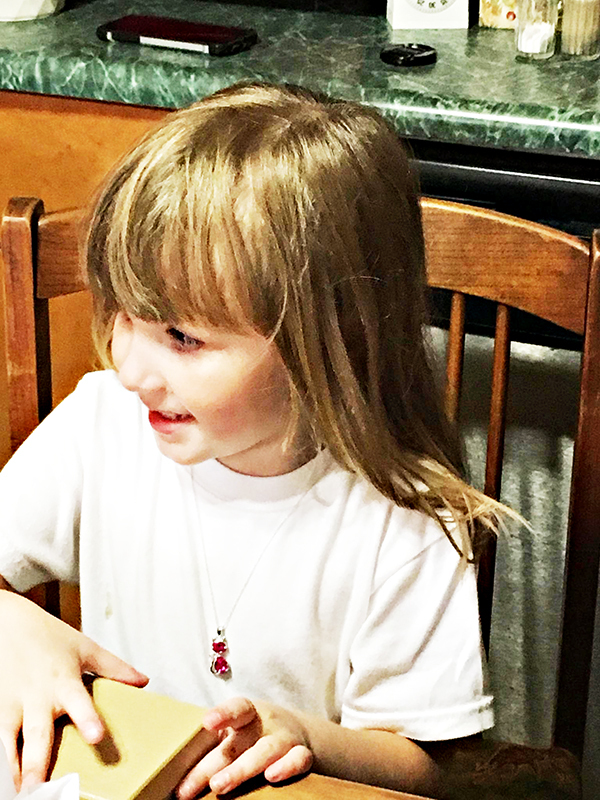 She's wearing the pink sapphire kitty necklace that I sent to her. Speaking of my great grandchildren, they are all growing up so quickly. I have a few more photos to share. These are three more of my great grandchildren. 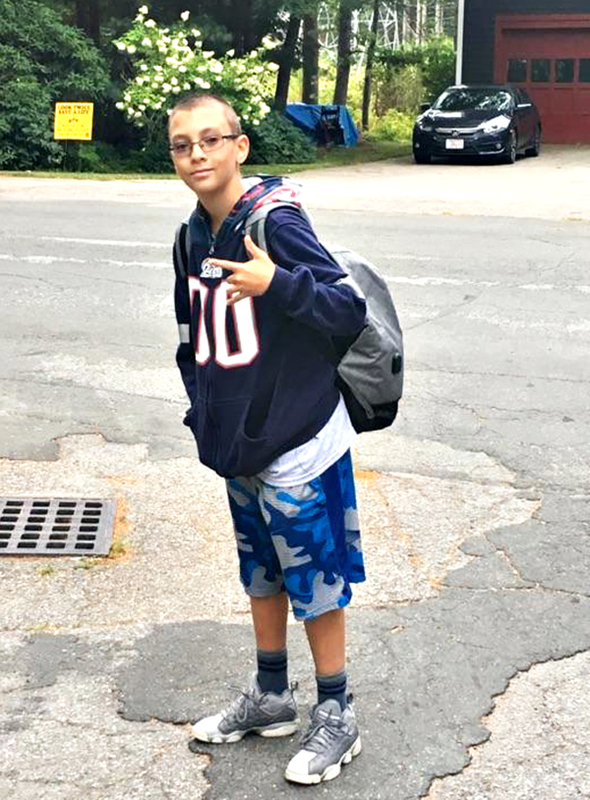 Jack (top photo) just started the seventh grade, and will be thirteen years old soon. 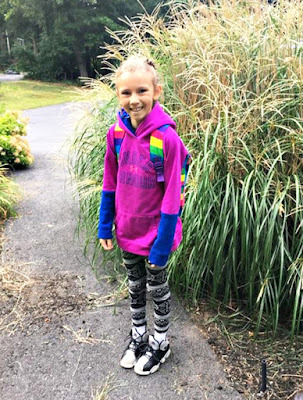 Lilah (center photo) has started the fifth grade and has just recently turned ten years old. The bottom photo is Alima. She will be turning two years old this Fall. Gosh, they are all so beautiful. Randi, thank you so much for the photos. I am so blessed! This morning I have an appointment with my orthopedic doctor for a follow up on my shoulder. That last shot of cortisone was supposed to take away the pain. But, it didn't! I don't really want another shot. I just want to know what my options are. I'm pretty sure that my favorite option is to just ignore the pain and hopefully it won't bother me too much. That's what I do now. Yesterday, I went back to the jeweler's shop to leave my rings that need new bands. Gosh, my hand feels so naked! I never take off my Goddess ring. That one is so special to me. The jeweler said that he would try to have that ring ready for me today. That would be nice, but I'm not counting on it. The other two rings may take a bit longer, but that's okay. I'm also getting new appraisals. Well, time is slipping by on me again, so I'd best take my leave here. I need to be getting ready for my appointment soon. So, till tomorrow, Y'all have a fantabulous day. Good morning. This morning is cool and gray with a slight breeze. Temps will get up to around 71F degrees today. At some point the rain should be coming this way. Our weather forecast for the next few days calls for rain and wind. How much we get remains to be seen. It's sort of a sad way to celebrate the end of summer. Yup, these are our last days of summer. Try to enjoy them. Today, Pogo and I will take a ride back to the jewelers store to leave my ring. I never take the ring off, so the band wore very thin and broke years ago. I've been wearing it with tape on the band all this time. I don't like to take my ring off. Even worse, I don't like leaving it anywhere. But now, it can't be helped. It really needs to be fixed. While we are at the plaza where the jewelry store is, we'll stop in at the pet supply store too. So far, Pogo has been eating some of the doggie food that we bought there the other day. We need to pick up a few more little tins of it. If Pogo will eat it, I'll buy it for him. I'm going to have to get serious about a new yarn order. 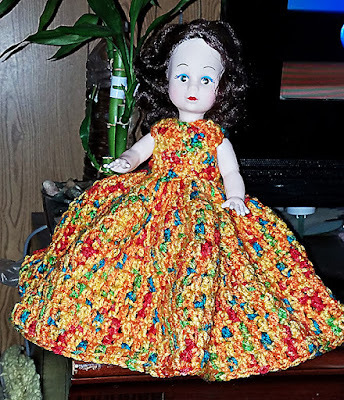 I finished up three dolly dresses over the last few days and now my hands are feeling too idle. My hands like to be busy when I am sitting down to watch TV, or just resting. 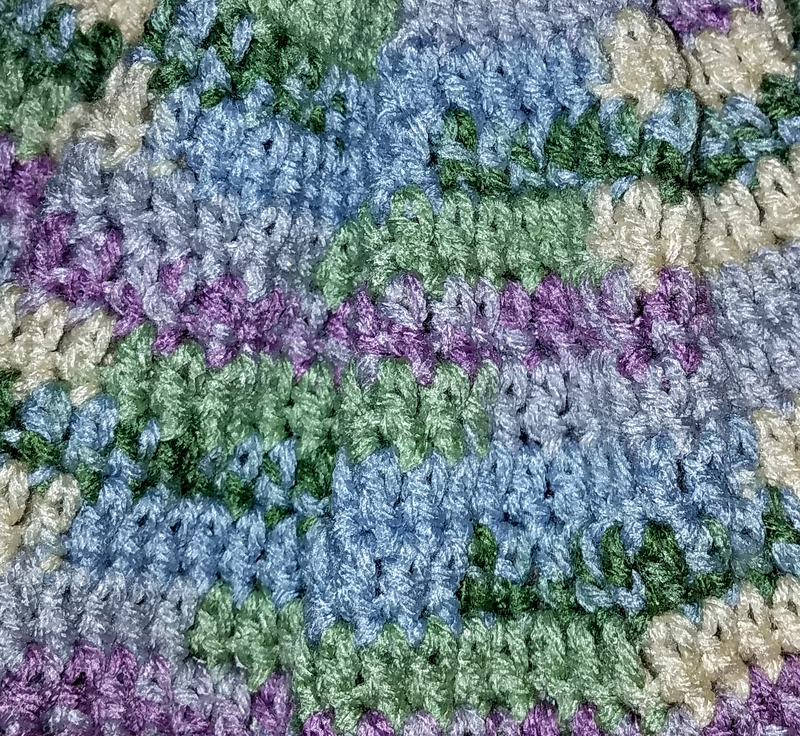 As soon as I can decide on the colors, I will start a new afghan. These are the colors of the dresses that I finished over the weekend. The first photo is called Grape Fizz. The second one is Watercolor, and the third one is Wildflower. This morning, I'm watching a story about spousal abuse. It's really horrifying to see what a lot of men and women go through before they are able to ask for help. I know from counseling some of these women (in years past) just how difficult it is to reach a point where they can walk out of the relationship. Sometimes they can leave with their children, and sometimes they have to leave them behind. It's really a sad situation. Soon I will have to get dressed. Once the mail comes, Pogo and I will be ready to leave to do our errands. I need to wash the breakfast dishes too. On that happy note I'll take my leave. So, till tomorrow, Y'all have an awesome day. Good morning. Tis cool and quite cloudy this morning. We have a bit of rain and maybe winds coming soon thanks to the summer storms, I think. I'll have to check with the weather channel in a little while. Right now, I'm watching Law And Order, which is a bit more interesting. Friday morning, Deanne and I went to the shooting range for a bit of practice. Deanne did super well. I didn't do so bad either. My shoulder makes it a bit difficult, but I can still hit the bulls eye. I used Deanne's gun for a few shots, and I really like it. Pogo says that he'll get me one for a combination birthday/Christmas gift if I want one. Hmmm, I'll have to think about that. (He's so good to me!!) Here's my target from Friday's practice. Yesterday, Pogo and I went shopping at the gun shop and I bought a magazine loader for my gun. As soon as I figure out how it works, I'll be able to practice loading the magazine. Pogo behaved so well in the gun shop that he was invited back whenever he wants to go. He's quite an impressive and well behaved little fellow. When we left there, we went looking for a little jewelry shop that the isntructor's brother owns in a nearby town. Thank goodness for the GPS in my car. Without it, we'd have never found the little shop. We had a pleasant chat with the owner, and we'll go back tomorrow so that I can leave one of my rings for repair and an appraisal. 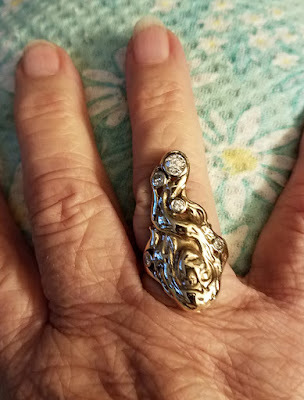 I have another ring that needs the band repaired, so I may also take that one with me to drop off. I'll be needing a new appraisal for that ring too. Before we headed for home, we stopped into a new pet supply store where we picked up a couple new shirts and some new doggie food for Pogo. He hasn't tried the shirts on yet, but last night he did eat a plateful of the new doggie food. Wow!! 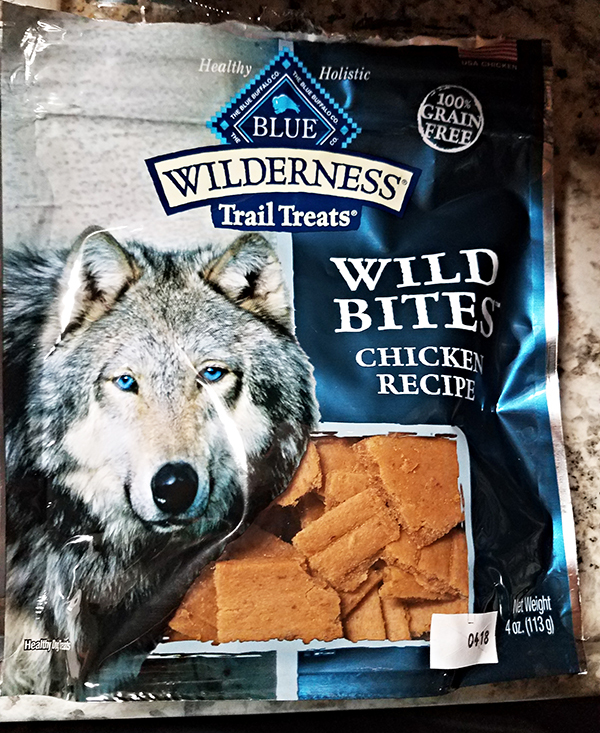 We also picked up a bag of soft doggie treats, and Pogo actually ate a piece. Wowsie! Will wonders never cease! This is the doggie treat. I got a new catalogue in the mail Saturday, so I spent some enjoyable time looking through it. I found a few things that we could use so I ordered them on-line. There was a beautiful bedspread and shams that Audrey liked so they are being sent to her. I found a few things that will be gifts, so they will come here and go into the holiday tote. 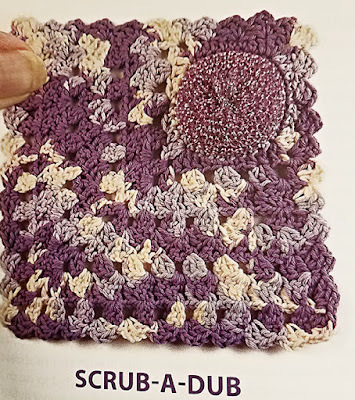 When I was last at Walmart, I picked up a new pattern book. This one is for crochet kitchen cloths. I think I'll try the one with the scrubby in the corner. After my other projects are finished, of course. 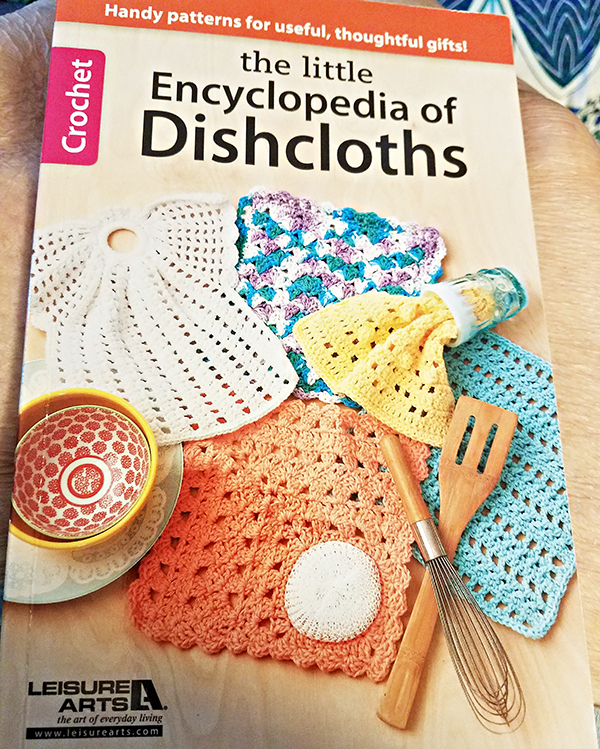 Here's a photo of the little pattern book, and the scrubby dish cloth. Today I have a new quick page for you. 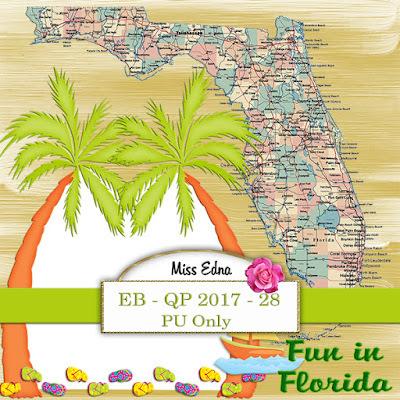 Now that the hurricane has gone by, and Florida can start to mend and rebuild, I thought that this might be a good page for your vacation photos. I did call to see how much damage my timeshare condo got, and the news was good. Aside from losing electric power, there was very little damage from the storm. Now I can look forward to going there next March. Now I'm going to make a fresh cup of coffee and watch a bit of TV. So, till tomorrow, Y'all have a fantabulous day. Good morning. Today is a bit cloudy and warm with a bit of a breeze. It's not raining yet, so it is quite nice. I won't be much of a chatty Cathy today because I have to get ready soon to leave. Deanne and I have an appointment this morning at the shooting range. The instructor texted me last night to say that the new ear phones that we had ordered have come in. Up to now, we've been using his earphones. This will be a nice break from my crocheting. I seem to be making a lot of mistakes lately and have been ripping lots of rows out. I guess this is a sign that I need a short break. I think tomorrow I'll take all my dollies out to the porch and apply all the embellishments to them. After a short photo session, I'll pack them all away. 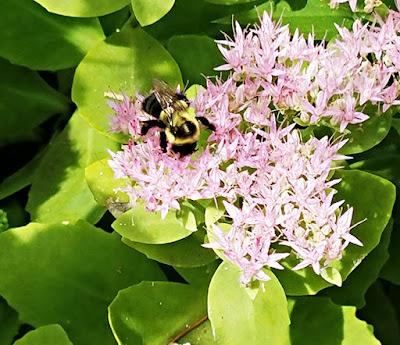 Yesterday, while Pogo and I were out in the yard, I noticed quite a few bees busy at work on some of my plants. I took a few photos, and I have a question that I'm hoping someone might be able to help me with. My question is: Does anyone know what this plant in the last photo is? I have tons of it. 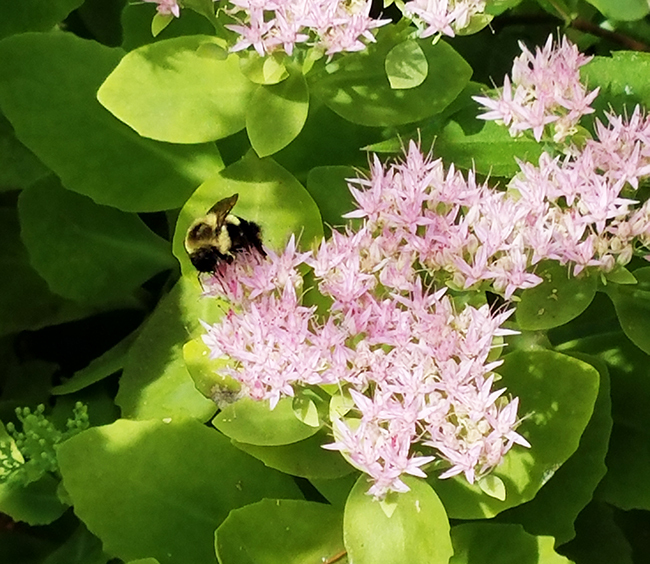 It is quite pretty and the bees love it. I have looked it up on Google, but there are a lot of plants there that look like this so I'm still not sure what it is. In the wee hours of the morning, around 3:50 a.m., Pogo decided that he was finally hungry enough to eat his supper. I finally got up and got it for him. He quickly gobbled it up and was looking for more food so I gave him a plate of canned chicken. When he finished eating that, he climbed back up on his little sofa and went to sleep. I guess he has me trained pretty good, huh? Enough of my babble. It's time for me to start getting dressed and ready to leave. So, till Sunday, Y'all be safe and have a fantabulous weekend. Good afternoon. I decided that I would do my grocery shopping this morning instead of waiting till later because we may be getting some rain. By the time I did my shopping and got it all put away, the morning had somehow turned to afternoon. Of course, in between putting things away, I brought in the mail and sorted it, fed Pogo, and chatted on the phone for a little bit. I also put a couple of gifts away (that I picked up) in the Holiday tote. While I was shopping, I found a color yarn that I need for one of my little dollie dresses. Now I can finish making the last couple dresses. Today's post will be a bit short because I have lots of things that need to be done today around here. I want to put in another load of laundry too. Pogo has been running back and forth from the door to me and back to the door. 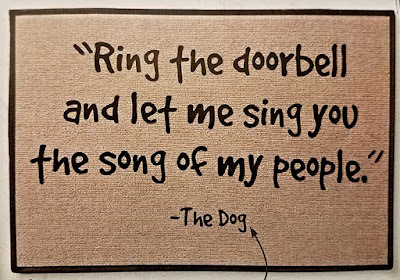 That usually means that he wants to go outside for a bit. I've learned to heed this particular message from him. I do have one thing to share today. Yesterday, a book that I had ordered came in the mail. 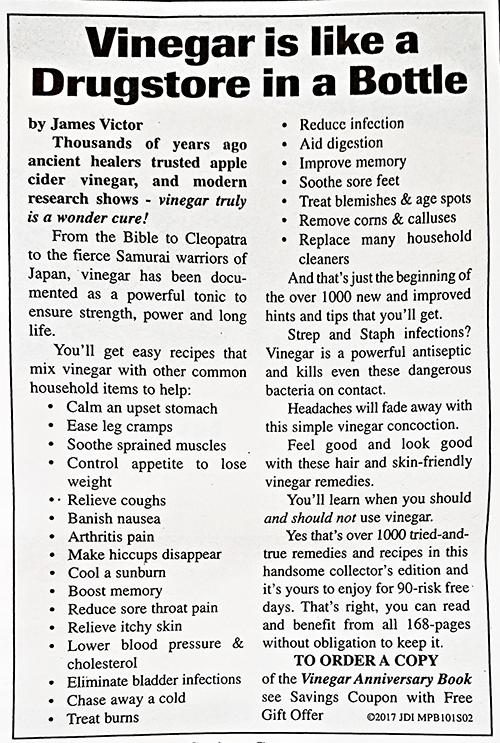 This one tells all the different ways to use and benefit from vinegar. So far, I've read a couple of the chapters, and it is really interesting. 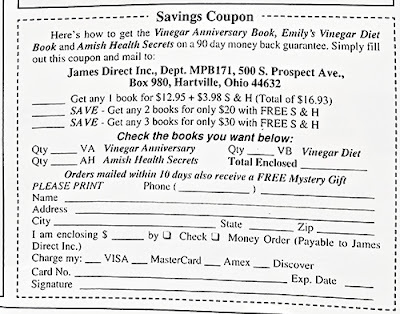 If anyone is interested, I'm posting the advertisement for the book and the order form. If you click on them, they will appear larger so that you can read them easier. You can also Google the book and order it online. That's how I ordered my copy. 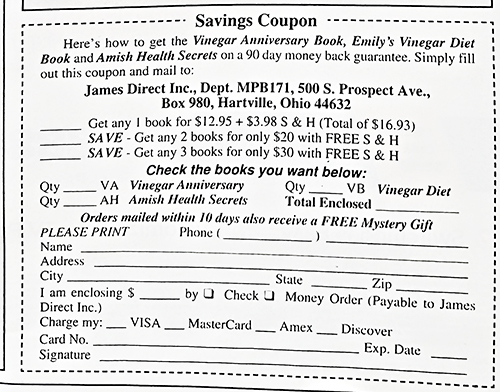 It's the quickest way to receive the book. Now I'm off to take my handsome little guy outside for a bit before I start on my chores. So, till tomorrow, Y'all have a fantabulous day. Good morning. We're enjoying another gorgeous day here in New England. 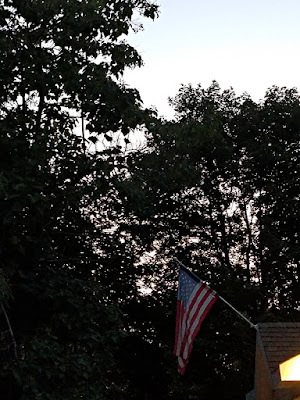 Temps are in the seventies, working their way to the mid eighties with a slight breeze. As for Hurricane Irma, I'm guessing that she has downgraded to just a lot of rain because I'm not seeing much about her on the Weather Channel. They are mostly focusing on the devastation left behind. Hurricane Jose is being watch closely now. Just how close to land he'll make, and where, isn't known yet. He's about five hundred miles from The Bahamas right now. The weather patterns right now are crazy. There are Winter weather advisory warnings out for parts of Montana, with snow expected. Yeesh! It's still summer! Yesterday was rather a lazy day for me. 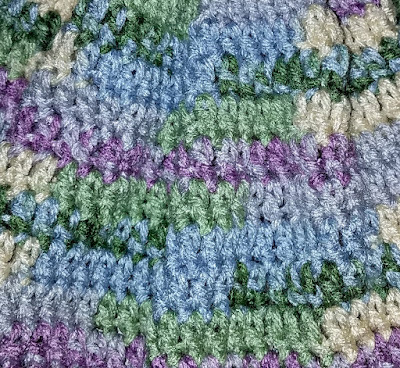 I did a couple chores around here, then did a bit of crocheting. I have two more dollie dresses to make to finish up my current projects. Of course, they all still need to have their embellishments put on. I'm thinking that by next week, I can start boxing a few things. I'll label them, or at least put a slip with a name in each box. I've been watching "Unsolved Mysteries" on TV. An announcement just came on the screen saying that "routine maintenance is being performed." When did this start happening? I've never seen this on my TV before. They do shut down programming every morning around 2 a.m. to update programming. It takes about four or five minutes, then the programming comes back on. This daytime "routine maintenance" is something new. Today I think I'll start making up my shopping list. I haven't been to the supermarket for a while and some things are running very low or out. I also want to do a bit of laundry. Later, DIL Janet will be coming by after work. That's a really nice way to end my day. 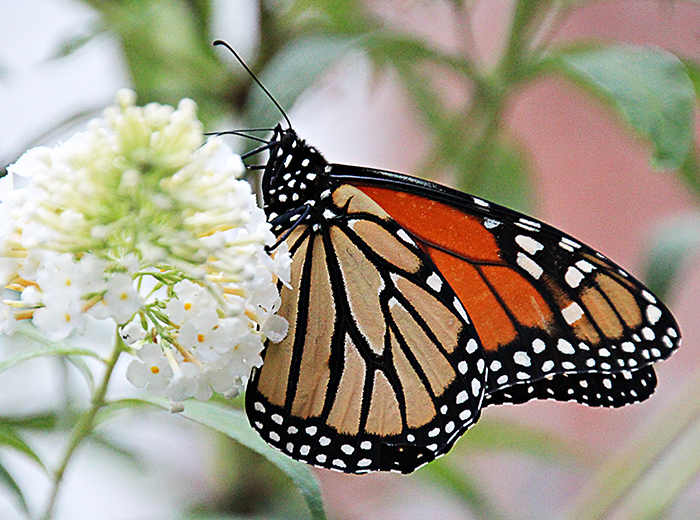 This year, I haven't seen very many butterflies, so I dug into my photo archives for this photo. Now that my butterfly bushes are beginning to grow again, I'm hoping to see more of these beauties flitting around in my yard. I also dug out this adorable photo of my handsome little guy. The photo was taken five years ago, just a few months after he came to live with me. He still looks the same today. I slept really good last night and did not want to get up this morning. However, my late start to this awesome day means that I am running out of morning, and need to get busy with my laundry. Before I go, I do have a new quick page for you. 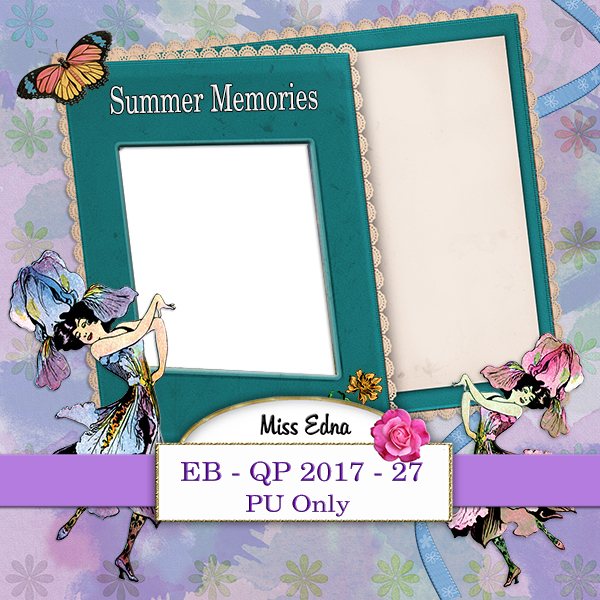 This one might be good for saving some of your favorite summer memories. Now I'm off to keep a date with my washing machine. So till tomorrow, Y'all have an awesome day. Hurricane Irma Just Won't Give Up! Good morning. I almost feel guilty saying that the weather here is awesome. But today really is a lovely day and I'm thankful for it. Last yesterday afternoon, I heard from Gary Jr, and all is well there. I heard from my friend Rhoda, and they are okay too. Last night I heard from Sean and they are all alive. However, he has most likely lost both his home and his boat. His place took a direct hit from the hurricane. Sadly, this storm is still ravaging other states. It is now being called a tropical cyclone and is lashing out at Georgia, North and South Carolina, Kentucky, West Virginia and Virginia, and reaching out as far as Indiana. I'm praying that Hurricane Jose turns and dies out at sea before he can add to the devastation. How much more can folks handle? Give me a moment here, I'm making a fresh cup of coffee. I had to drink my first cup cold, because I spent a lot of time on the phone trying to track an order that should have been here yesterday. The company said it was hand delivered to a resident here, but that is not the case. I was the only one home when the mail came and the package was not in the mail. One package that did arrive yesterday was the air freshener doll bodies that I had ordered. Woo Hoo!! Now I can start finishing my dollies. There's no way I can sew all those little hook and eye sets on the dresses, so I laced up the backs of the dresses instead. Today or tomorrow, I'll sit down and start putting the embellishments on the dresses. Here are a couple photos of the dollies so far. The top photo is called "Beach Day" and the second photo is called "Cactus." I have to say that these two are my favorites. 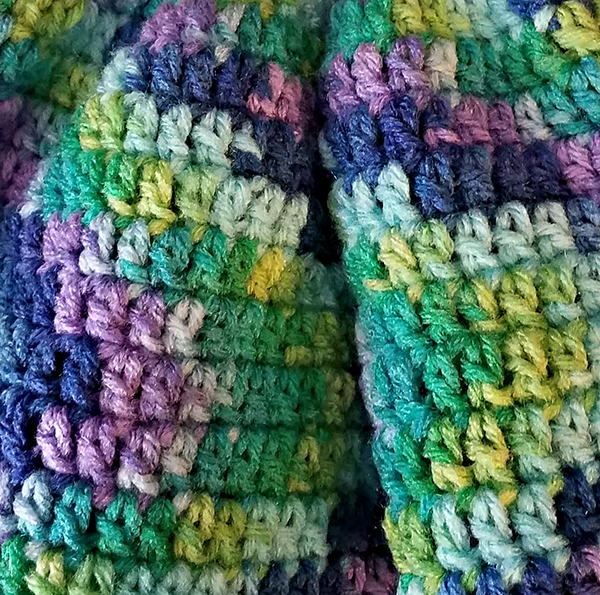 I love the colors in the yarn. All my dollies have dark hair except this one little blonde, but they are all adorable. 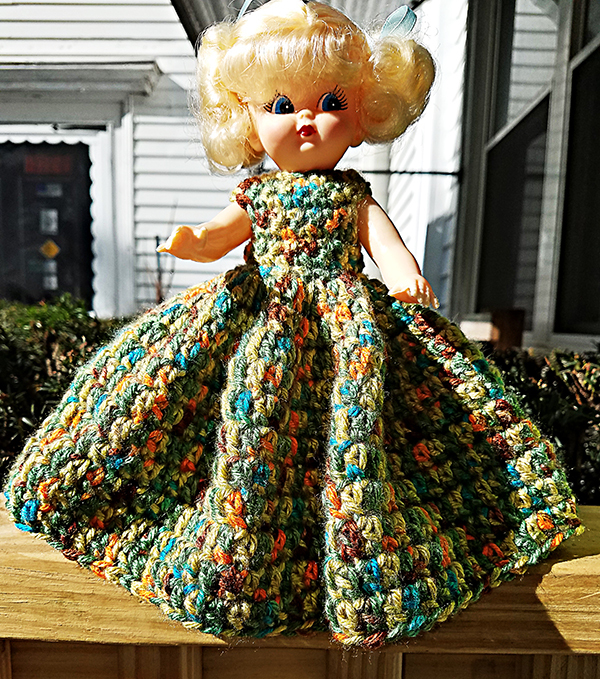 I'll take more photos when the dollies are completely finished. Yesterday I ordered my new blog book before the discount price ran out. I like to take advantage of these sales. Unfortunately, that means that I have expired all QP and kit links through the end of August. Hopefully, you all downloaded the ones you wanted. You can always send me your email address if you need any of the links and I'll send them to you. 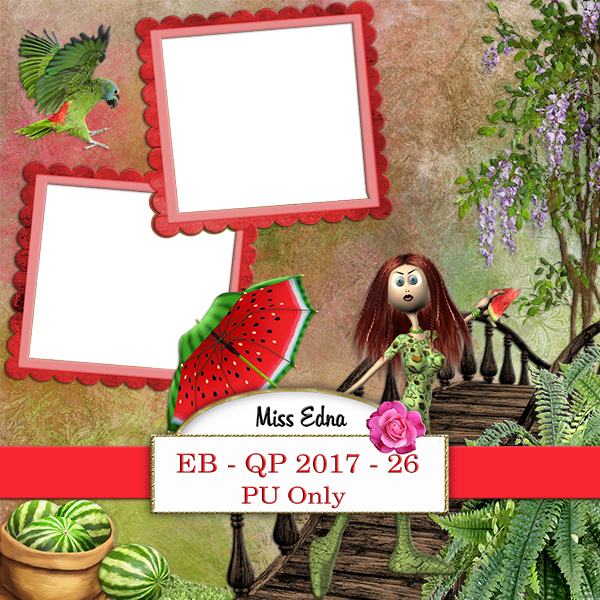 These are the photos I chose for the front and back covers of my newest blog book. Before I start on any chores today, I need to pick out a few skeins of yarn because I still have about four more dollies to make. 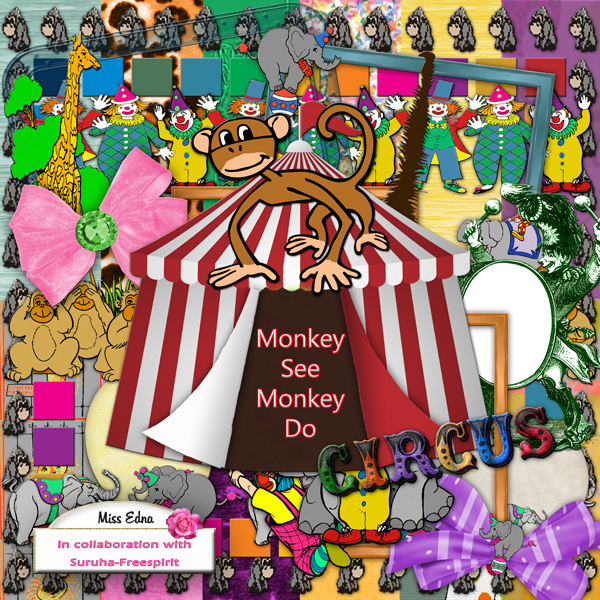 They are such fun to make. After this, I'll be finishing up the bed dolls that I made. These dresses also just need embellishments. Now I think I'll enjoy my new cup of coffee while a catch up on some blog reading. So, till tomorrow, Y'all be safe and have a fantabulous day. Good morning. The weather here is really nice today. The sun is shining, there's a little breeze and the temperature is supposed to reach the low eighties. Temps are supposed to be this way for the next few days before dropping back down into the seventies. I spent most of yesterday and last night watching the weather channel, following the storm's path all the way through Florida. As of yesterday afternoon, both my boys were still okay. (as well as could be expected) I just heard from Gary Jr, and he says he's okay. I still haven't heard from Sean or my friend Rhoda. Hopefully, I'll hear from them soon. There are more than six million people without power so far, and that number will be increasing as the storm continues on into Georgia, South Carolina and Alabama. This has to be one of the worst hurricanes we've had to date. So far, we've had two category 4 landfalls (Houston and Marcos Island) in just a few days, while there is another storm (category 2 already) brewing in the Atlantic. I can't imagine the devastation to the Florida keys and the Bahamas, and the other small islands that were hit by this hurricane, and to the folks in Texas and Louisiana that were hit by the last hurricane. God help everyone as they try to rebuild their lives and homes. 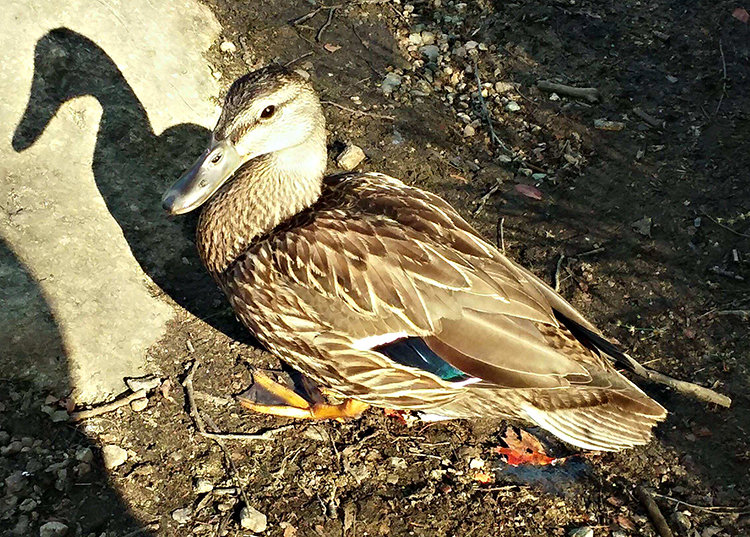 Joe went to the park again yesterday, and sent me this photo of one the ducks that comes to greet him when he gets there. The ducks know that Joe will have some food with him, and they walk right up to him and take the food from his hand. How awesome! Now I'm going to make a fresh cup of coffee, and catch up a bit on my blog reading. So till tomorrow, Y'all be safe and have an awesome day. Good morning. It's quite lovely here, but down South, Hurricane Irma (Cat 4) has made landfall in the Florida Keys. The winds are horrific, and are being felt throughout the southern part of the state. I'm watching storm videos on TV. It is showing how bad the winds (gusting over 100 miles an hour) are in Miami along with some flooding, and Miami is one hundred miles away from the center of the storm. The eye of the storm is heading to make landfall in or near Naples, in the southwest part of Florida. 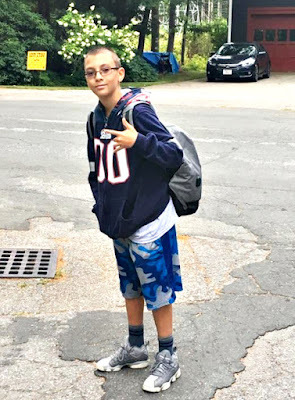 I have a stepson and two grandchildren living in Naples, and my son Gary Jr. also lives on the West side of Florida too, only he's further North. I also have other grandchildren and some very dear friends living in Florida. I pray that they will all come through this wicked storm safely. There's not much happening here. I've been crocheting, trying to finish up these hat and scarf sets. The blue (Lapis Lazuli) set is finished, and is really quite pretty. I started working on the pink set (Tourmaline) and after just a few rows, I ran into some really bad yarn. 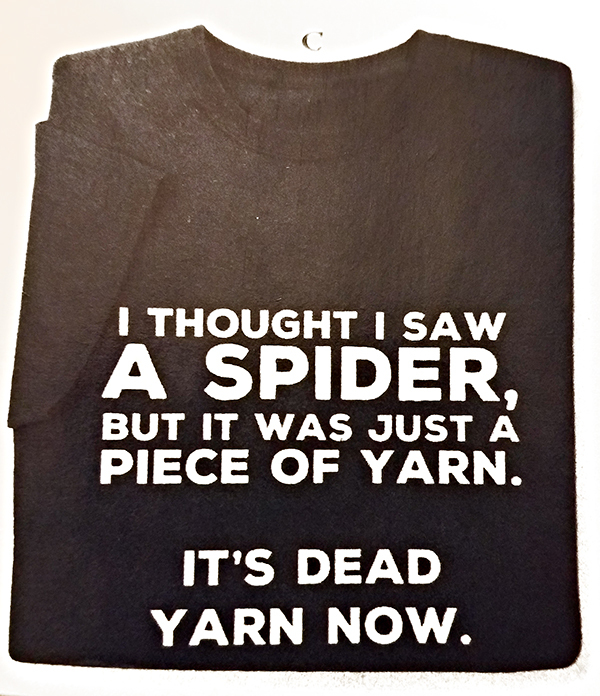 It just wasn't workable and there was quite a lot of it so I called the company where I bought the yarn. They were really nice and are sending me two new skeins of the yarn. I've been looking over the yarn color pages in the Herschners catalogue, and I'm trying to decide which colors to order for another afghan. Some of the colors are so yummy looking, they could be served up on a platter. hahaha. Daughter Deanne and Janice stopped by a couple days ago, and brought me a new little solar thingy for my porch. 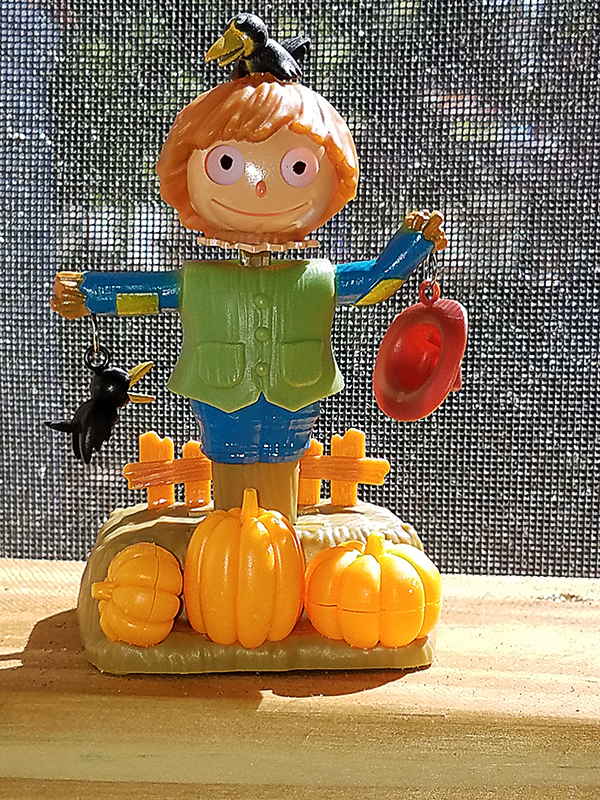 This one is a scarecrow and pumpkins for Autumn, and is ever so cute. Today I have a new quick page for you. This one is just a bit of "watermelon whimsy." Have fun with it. Now I think I'll make a fresh cup of coffee and do a bit of blog reading. So, till tomorrow, Y'all be safe and have a fantabulous day.